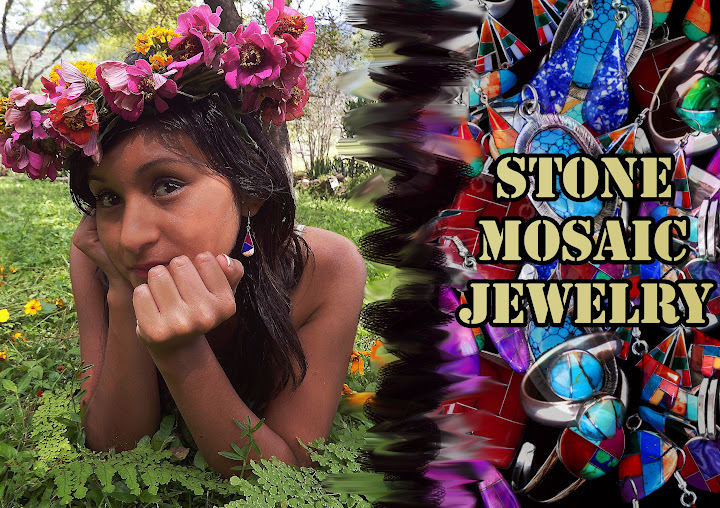 Stone Mosaic Jewelry is the unique creation of this meretorious village craftswomens' cooperative in rural México combining world class lapidary work with an expert eye for color and design harmony. You can look all you like. There is nothing like this jewelry anywhere in the market. One can only compare it to fine Zuni and Navajo jewelry where each piece costs at the very least a hundred dollars. "What is stone mosaic jewelrey? This technique evolved out of the centuries old tradition of the Dene,Hopi and Zuni peoples ,original inhabitants of what is now the Southwestern United States. The original inlayers used turquoise, corals and shells encrusted in silver in geometric patterns. Now using modern lapidary technique and and a staggering array of inlay materials, the native crafters of Tecalpulco have created a dynamic modern continuation of this ancient art. This jewelrey does not imitate or try to look like a superior product,it is indigenous unto it self.It is authentic.What hasn't changed is the precision and patience required to produce this beautiful jewelrey. With the availability of so many beautiful stones from all over the world and the continued employment of local more traditional materials such as abalone shell,spiny oyster shell,bone and coconut shell. This is a fine continuation of a noble tradition."